Despite the heated public controversy over radiation fallout, what none of the “experts” could have revealed was its whole track history. And, consequently, none could have identified its real menace. As L. Ron Hubbard revealed, “‘You can’t see it. You can’t feel it. You can’t…’ These are the engramic phrases behind the whole effect of radiation.” So immediately after the Anti‑Radiation Congress, where he warned that the rising radiation count paralleled the increasing difficulty of cases, he convened the 16th American ACC to teach, with urgency, an auditing solution of truly historic dimensions: “In this ACC we’re going to cover Communication, Control and Havingness. That’s the total of our coverage.” Here, then, are the lectures where Mr. Hubbard introduced—and demonstrated in a live auditing session—a technical breakthrough ranking in importance with ARC and removing the barriers to broad scale clearing. Destined to stand as a fundamental processing regimen on the road to Clear and OT, CCH marked a new depth of undercut in providing the entrance point to every case. Moreover, L. Ron Hubbard was about to do the same for auditors with a series of revolutionary training procedures drawn from the very fabric of CCH discoveries. As 1957 broke, tensions between the Western powers and the Soviet Union showed no signs of abating. The Soviet defense minister had announced his government’s intention to add chemical and biological weapons to Russia’s already massive arsenal of thermonuclear bombs. US President Eisenhower, having called for an increase of American nuclear weaponry in 1956, opened the New Year with an unprecedented declaration to Congress of his intent to use whatever means he deemed necessary—including military force—to prevent communist expansion in the Middle East. While the US Atomic Energy Commission continued to insist that nuclear weapons tests conducted in the United States posed no threat to Americans. “Now, what happens, then, as a person loses future? He certainly gets crowded in the present. He says, ‘There is no time’ and boy, that is awfully close to being true. Therefore his havingness is tremendously reduced. Therefore he gets no benefit from present time, even if he got into it. Why? Because he has no future! 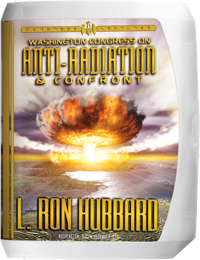 Responding to a threat of truly global urgency, in the closing days of December 1956 L. Ron Hubbard had summonsed the Anti-Radiation Congress, in which he alerted Scientologists that parallel with the increasing difficulty of cases since 1950 had been the rising radiation count in the atmosphere. Then, right on the heels of that Congress, on 2 January 1957, he launched into remedial action of equal urgency—specifically, the 16th American Advanced Clinical Course, held at the Founding Church of Scientology, 1812 19th Street, Washington, DC. And whereas Mr. Hubbard’s primary focus had previously been on developing processes that auditors other than himself could apply to crack cases, he had now redoubled his concentration on reaching even deeper into cases themselves. It was a discovery whose ramifications extended far beyond Earth 1957. For if Mr. Hubbard’s researches had been driven in part by a need to accelerate Scientology expansion in the face of a possible holocaust, what he now unveiled was an auditing breakthrough of staggering implications—as those CCHs would soon become a crucial component of Clearing Procedure and take their place thereafter as a fundamental series of processes enabling auditors from New York to Tokyo to move preclears up towards Operating Thetan. Beingness—how the road to beingness is an increasing ability to control the body. With the release of the CCHs, Mr. Hubbard had lifted the curtain on a new era of auditing and paved the way for broad scale clearing. 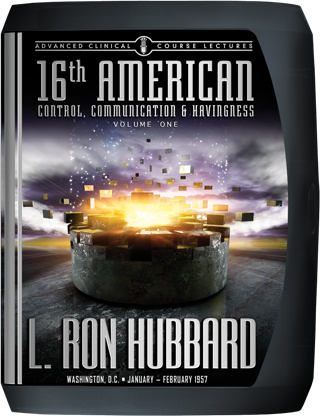 And even as the auditors from that 16th ACC fanned out across the United States to apply and disseminate all they had learned, L. Ron Hubbard was developing a series of procedures drawn from the very fabric of CCH discoveries—procedures that would soon revolutionize the training of auditors.